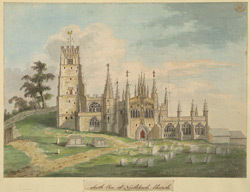 South View of Northleach Church in Gloucestershire. This is one of the most prominent and impressive of the Cotswold Wool Churches. Its building was due to its patron, John Fortey, a wealthy wool merchant, who supported it during his lifetime and upon his death in 1458/9, he left £300 for its completion. As can be seen in this view, the church had a particularly impressive south porch with a chamber above it lit huge four light windows. There are some good examples of 15th century carvings of saints on the porch and on the roof tall crocketed pinnacles and a central crocketed bell-turret. The west tower is built in four diminishing stages.